The filter on the WebClient is based on the “filter on the client:https://help.passwordsafe.de/v8/1/en/topic/filter. Therefore, only those characteristics specific to the WebClient will be described here. Operation of the “WebClient filter” barely differs from the operation of the client filter. 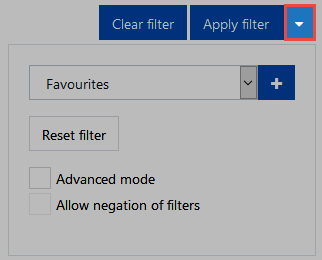 It is only necessary to note that the Clear filter and Apply filter buttons can be found above the filter. The configuration settings can also be found directly above the WebClient filter. New filter groups can be added using Add filter groups and the current filter can be reset using Reset filter. Advanced mode provides you with the possibility of deleting or moving individual filter groups. The Allow negation of filters option can also be selected. The structure can be operated in precisely the same way as on the client.